The hills of Donegal offer many lifetimes of beautiful places to visit. They are a dream destination for hillwalkers and rockclimbers alike. 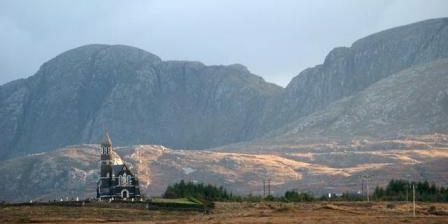 Errigal Youth Hostel in the village of Dunlewey is the perfect base for exploring some of the remoter sections of the hills of Donegal.In this post, Iain Millar tells us about just some of the places within a very short distance of the hostel. The nearby Derryveagh Mountain range stretches from Doocharry village at the southern end to Glenveagh Castle and visitor centre at the northern end. They make up two huge mountain chains. The chains run parallel to one another and provide the average walker with an enormous range of walks from low level lakeside rambles to much more strenuous mountain climbing to the summits of Donegal’s remotest peaks. Directly behind the hostel lives Errigal and the highest of the hills of Donegal. The most popular way to the summit of Errigal is by the south face route from the roadside carpark at 210 metres above sea level and the base of the southern slopes. Every year thousands of people park here and follow the trails through the blanket bog and up the shattered scree slopes to the mountains summit. For the more adventurous and experienced hill goer the north face of Errigal provides by far the best route to the summit. A walk from the hostel up the north ridge to the summit and back down the south face allows experienced walkers to make one of the finest mountain traverses in Ireland. Approx. 2 km from the hostel is the Poisoned Glen and Irelands’ highest mountain cliffs. The Glen provides huge alpine length rock climbs and long lonely walks over the more distant of hills of Donegal. For one of Irelands’ best circular mountain walks, start at the old roofless church and follow the valley path through the Poisoned Glen and up onto the high summits behind, continue along the summit ridge to Slieve Snaght. Return to Dunlewey by descending north and follow the river systems back to the starting point. Iain Miller is a hillwalker and rock climbing guide living, working and playing on the sea cliffs, sea stacks and mountains ranges of western Donegal. For much more information on the hill walking and rock climbing available on the sea cliffs, sea stacks and mountains of Donegal visit his climbing site. We will have more from Iain about Donegal adventures in the coming months so make sure that you sign up for our newsletter.